History of Composite Materials | Mar-Bal, Inc. The history of composite materials in manufacturing predates manufacturing as we know it today. From B.C. to the present, different types of composites were developed and used for a wide variety of applications. The times B.C. marked the beginning of types of composites materials used in daily applications. The first known use of composites is credited to the Mesopotamians. These ancient people glued wood strips at different angles to create plywood in 3400 B.C. etween 2181 and 2055 B.C., Egyptians used Cartonnage and layers of linen or papyrus soaked in plaster to make death masks. Around 1500 B.C., Egyptians and Mesopotamians builders and artisans used straw to reinforce mud bricks, pottery and boats. Around 25 B.C., The Ten Books on Architecture described concrete and distinguished various types of lime and mortars. Interestingly, research demonstrates that the cement described is similar, and in some ways, superior to the Portland cement used today. From the ancient times, builders, artisans, engineers and manufacturers continued to develop composites of a wider array of materials for more sophisticated applications. In about 1200 AD, Mongols invented the first composite bows made from a combination of wood, bamboo, bone, cattle tendons, horns, bamboo and silk bonded with natural pine resin. These small, powerful, extremely accurate bows were the most feared weapons on earth until the 14th century invention of effective firearms. From the 1870’s through the 1890’s, a chemical revolution changed composite development. New synthetic resins were transformed from a liquid to solid state in a cross-linked molecular structure using a process known as polymerization. Early synthetic resins included celluloid, melamine and Bakelite. In the early 1900’s, chemical advances drove the development of plastics. Materials such as vinyl, polystyrene, phenolic and polyester were created and reinforcement was needed to provide strength and rigidity. Polyoxybenzylmethylenglycolanhydride, or Bakelite as it’s commonly known, was developed by Belgian-born New York chemist Leo Baekeland in 1907. A thermosetting phenol formaldehyde resin, formed from an elimination reaction of phenol with formaldehyde, Bakelite stands as one of the first plastics made from synthetic components. Its nonconductivity and heat-resistant properties made the composite widely used in industrial and consumer goods applications including electrical insulators, radio and telephone casings, kitchenware, jewelry, pipe stems, and children’s toys. Today’s collectors love the “retro” appeal of Bakelite. In 1993, in recognition of Bakelite’s significance as the first synthetic plastic, the American Chemical Society designated Bakelite a National Historic Chemical Landmark. Recognized as the most important decade in the composites industry, the 1930s saw the development of resins still used today. In 1935, Owens Corning introduced the first glass fiber and launched the fiber reinforced polymer (FRP) industry. In 1936, unsaturated polyester resins were patented. Because of their curing properties, unsaturated polyester resins are the dominant choice for resins in manufacturing today. In 1938, other higher performance resin systems like epoxies also became available. The necessities of World War II took the FRP industry from research to production. In addition to high-strength-to-weight properties, chemists learned that fiberglass composites are transparent to radio frequencies. This led to the composite’s adaptation for radar domes and other electronic equipment. Although not deployed or commercialized until after WWII, the first commercial grade boat hulls were developed in this decade. By 1947, a fully composite body automobile was prototyped and tested, leading to the development of the 1953 Corvette. Fiberglass preforms impregnated with resin and molded in matched metal dies were used to build this classic car. The advent of the automobile age gave rise to several new methods for molding. Two methods, compression molding of sheet molding compound (SMC) and bulk molding compound (BMC), emerged as the dominant forms of molding for the automotive and other industries. In early 1950’s, manufacturing innovation continued with the developments of pultrusion, vacuum bag molding, and large-scale filament winding. These composites continue to find applications today. Pultrusion is used in the manufacture of linear components such as ladders and moldings. Filament winding is one example of aerospace composite materials. It became the basis for large-scale rocket motors that propelled exploration of space in the 1960’s and beyond. In 1961, the first carbon fiber was patented and several years later, became commercially available. Carbon fibers improved thermoset part stiffness to weight ratios, for use in even more applications such as aerospace, automotive, sporting goods, and consumer goods. In the 1960’s, the marine market was the largest consumer of composite materials. Over the next twenty years, the composite materials market advanced. New ultra-high molecular weight polyethylene joined other advanced fibers used in breakthroughs in aerospace components, structural and personal armor, sporting equipment, medical devices and other applications. In the 1970’s, the automotive market surpassed marine as the number one market – a position it retains today. From this humble beginning, Mar-Bal grew into the most integrated thermoset composites solution provider today. By the mid 1990’s, composite materials became more common in mainstream manufacturing and construction. 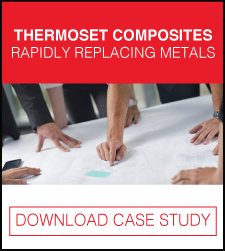 As a cost-effective replacement to traditional materials like metal and engineered thermoplastics, thermoset composites were common components within the appliance, construction, electrical and transportation industries. In the mid-2000s, the development of the 787 Dreamliner validated composites for high-strength and rigid applications and the continued development of finish technology, like PVD and THERMTIAL™, expanded the number of applications in the automotive, appliance and consumer products industries. Today, composites research attracts grants from governments, manufacturers and universities. These investments allow innovation to accelerate. Specialized companies, such as aerospace composite companies, will find a place in the industry. Two applications that continue to experience innovative growth are airplane composite materials and composite sheets for marine use. Other materials such as environmentally-friendly resins incorporating recycled plastics and bio-based polymers meet the demand for stronger, lighter and environmentally friendly products. Looking ahead, still to be developed fibers and resins will create even more applications for everyday and specialized use.